Love these last two dresses! This one is so pretty, and I especially love the sleeves! Wow, that is just beautiful! Happy St. Patrick’s day Liana! OMG!!!! This dress is AWESOME!!!! Happy St. Patricks Day people!!! Happy St. Patrick’s day Liana, this dress is amazing as always, I am busy fighting with my friend Erin who has also posted a comment about who get this dress… WE LOVE IT!!! do you have a deviant account? Nice! The coulors were great together! I’d still wear this to faire if I could!! for accuracy issues, it’s pretty close but for the sleeves. Do a google search for the ‘moy gown’. 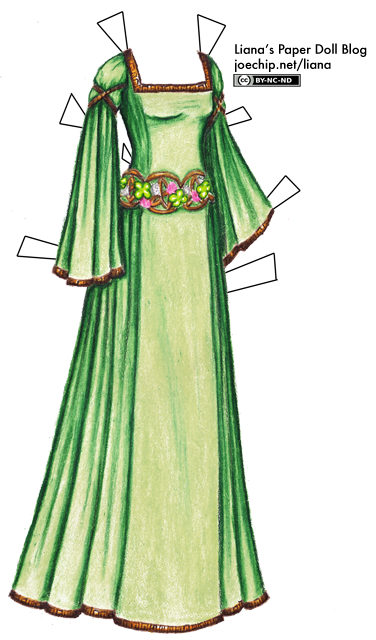 it was a gown found in a peat bog… generally, medieval gowns have small sleeves a way to save fabric (the houpelande being a major exception). It’s really nice! I love the sash, (or maybe belt? I think it’s a sash, but..) and how it incorporated the clover. I still can’t get how to exactly to the gathered effect, but I’m close. Out of curiosity, what’s your favorite color? I must have this dress! I love it! now THIS is my kinda’ dress!!!! I think this has to be my fav you’ve done so far! ABSOLUTELY LOVE IT! Happy St. Patricks Day ya’ll!! Gotta admit, I know nothing about Celtic or Irish culture, either, Liana, so you are not alone there. But, on the dress? Trying to think of a different adjective than “gorgeous”…and…failing…so I’ll go with gorgeous for now. But, later, I’m going to think of a better one for this great dress! I actually am an actor at a medieval faire, and the dress is not far off. The lovely tops of the sleeves you have are a bit fanciful, but the larger, wide sleeves did come into style as the 15th century wore on. It was a sign of wealth if you could afford the fabric for trailing sleeves. Also, it’s probably a bit low-cut, and would definitely have had a chemise underneath it. The chemise would have had long, fitted sleeves underneath, often in a contrasting color. Perfect! Perfect! Perfect! Happy St. Patrick’s Day! Historical accuracy is highly over-rated; in my reading,it seems that history is chock full of everyone being underfed, damp, cranky, and a bit grubby about the edges. Fantasy is much more fun!–Oh, and did I mention that I think that this lovely dress of yours is perfect for St. Patrick’s Day?! Pretty, if not necessarily St. Patrick-era Ireland. :P I love the belt. I wish this dress was real, and I had somewhere I could actually wear it. St-Patrick used a three leaf clover to explain the holy trinity while on missionary. Three identities, one being. Four leaf clovers, symbol of luck were introduced at festivities later on. The tradition and true story of saint patrick’s day has been lost in festivities. I am Irish and am so happy with the St. Patrick’s day dress. The belt or sash is a perfect addition. Love it. So Pretty! I love St. Patric’s day and this dress is so perfect. Words cannot adequately describe my admiration and adoration of this dress!!!!! My weakest attempt would be to say it’s beautiful!! !